The world has seen better days. The sun has ceased its rotation in the sky, bandits are restless in the wilds, and the dredge, a race of mysterious, armoured beings with no interest in diplomacy, are on the march once again. Focusing on two groups of fleeing fighters and villagers who eventually become one, The Banner Saga is a tale of hardship, loss, fierce combat, and choices. Terrible, horrible choices. The Banner Saga is a linked series of games. Consequently, some of the choices you make in this first title will carry over to The Banner Saga 2, and possibly beyond. It's worth playing the game several times to see just what will happen to your not-so-merry band when you make different decisions. 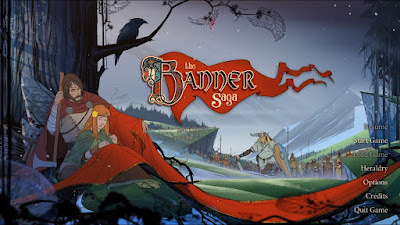 Gamers can relate with the plot story of Banner Saga, this kind of story are somewhat an illustrations of the ancient times, the way how our ancestors fought tribe by tribe. It's like learning from BestEssayEducation reviews experiences and battles. Well, such amazing information with a attractive banner i just read your amazing post this is need for our youth this is good idea i love your amazing post. great job. The story is very interesting. The character is very rich, I enjoyed this story.